This month, Dr. Williams presents a brief video chat discussing transitions – that in-between-time when we’re in the middle of a change taking place in our lives – perhaps something that used to be a part of our life has ended – but something new hasn’t quite arrived to take its place, just yet. That could mean a job, a relationship, a place of residence, a change to our health or even a change to our outlook on life. Anderson, Erin and Raymond Pun, eds. 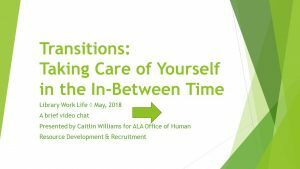 Career Transitions for Librarians: Proven Strategies for Moving to Another Type of Library. (Boulder, CO: Rowman & Littlefield), 2016. Bridges, William. Transitions 25th revised edition. ( Boston: DeCapo Press). 2004. Johnson, Whitney. Disrupt Yourself: Putting the Power of Disruptive Innovation to Work. (New York: Routledge), 2013. Schlossberg, Nancy. Overwhelmed: coping with Life’s Ups and Downs. 2nd edition. (Lanham, MD: M. Evans and Company) 2007.